The brain cancer program at UCLA’s Jonsson Comprehensive Cancer Center and the UCLA Brain Tumor Center has been designated a Specialized Program of Research Excellence, or SPORE, by the National Cancer Institute, making it one of only five brain cancer programs nationwide to receive this national recognition and substantial research funding. The designation comes with an $11.4 million, five-year grant that recognizes UCLA’s brain cancer program as one of the best in the country. The program supports research into the prevention, detection and treatment of one of the most lethal and deadly cancers, which often receives far less funding than other types of cancers. The SPORE designation is the second for the Jonsson Cancer Center. In October 2002, the prostate cancer program was named a center of research excellence, and was renewed in August 2013 for its third five-year funding cycle, receiving an $11.6 million grant from the National Cancer Institute. 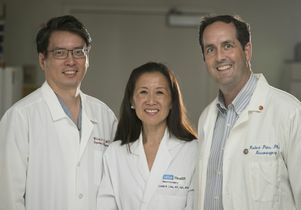 These grants promote cooperation among scientists in different disciplines, and UCLA’s program will partner researchers and clinicians to translate basic research from the laboratories into patient clinical trials much more quickly and effectively, said Dr. Linda Liau, professor and chair of neurosurgery at the David Geffen School of Medicine at UCLA and director of the UCLA Brain Tumor Program. The American Cancer Society estimates that 23,800 malignant primary tumors of the brain or spinal cord will be diagnosed this year, and 16,700 people are expected to die from the disease this year. Drs. Linda Liau and Robert Prins will investigate the mechanisms that make it possible for brain tumors to evade and overcome immunotherapy. The researchers hope that by understanding these factors, they can dramatically enhance the benefit of cancer vaccines that are already being tested in people by combining them with the appropriate immune checkpoint inhibitors. Drs. Timothy Cloughesy, Steven Bensinger and David Nathanson will focus on how metabolism can affect and regulate tumor resistance to targeted therapies. These insights can allow scientists to potentially exploit metabolic vulnerabilities, such as metabolic stress, to induce the death of cancer cells and improve how patients respond to targeted inhibitors by combining them with drugs that induce cell death. Drs. Frank Pajonk and Leia Nghiemphu will investigate new strategies to block the process by which radiation therapy can cause non-cancerous cells to become cancerous. People who are treated with traditional radiation often suffer a recurrence of their cancer, and this research could help improve clinical outcomes for people with brain and other cancers by combining radiation therapy with drugs that prevent the conversion of non-cancerous cells to cancerous ones. Drs. Albert Lai and Harley Kornblum will study how glioblastoma can become resistant to isocitrate dehydrogenase, or IDH, inhibitors, which are a promising new type of drug that targets a specific mutation in brain cancer cells. The scientists hope that by understanding the epigenetics of this process, it could lead to the development of new treatments for people with glioblastomas that harbor IDH mutations by combining IDH inhibitors with epigenetic drugs.